Mary Zimmerman’s 2007 production is a Victorian ghost story, adding the spectre that Lucia describes to her handmaiden Alisa as an actual woman in white on stage. Maestro Roberto Abbado begins with the orchestra playing slow, rumbling notes, complementing the ominous stage image of clifftop Lammermoor Castle. For the first scene, Zimmerman employs an iris effect, only revealing the rocky terrain and silhouetted trees on stage right. Pursuing an intruder to the grounds, the ample male chorus begins the evening in sturdy form. Italian baritone Luca Salsi sings Enrico with a rich, pure pure tone, characterising the desperate man as self-serving rather than particularly villainous. Ukrainian bass Vitalij Kowaljow maintains a solemn presence as chaplain Raimondo, singing with well-judged strength as the story progresses. An exquisite harp solo from Mariko Anraku announces the impending arrival of dear Lucia, a love struck young woman who has to cope with grieving for her mother while being manipulated as a pawn as part of her brother Enrico’s financial schemes. The half-curtain lifts, and the full stage picture reveals a discarded fountain placed amidst the hilly landscape. 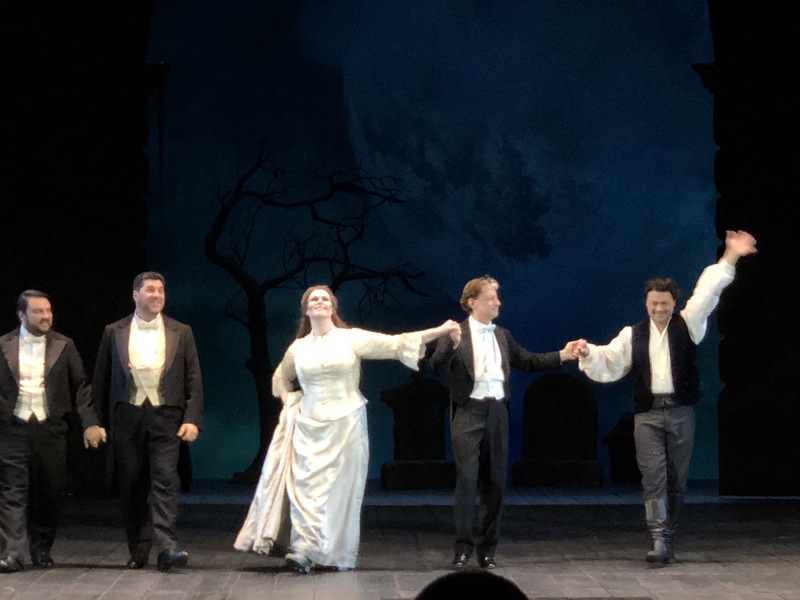 In a carefully calibrated performance, Pratt begins in a lower gear, portraying the relatively carefree Lucia as haunted but happy. 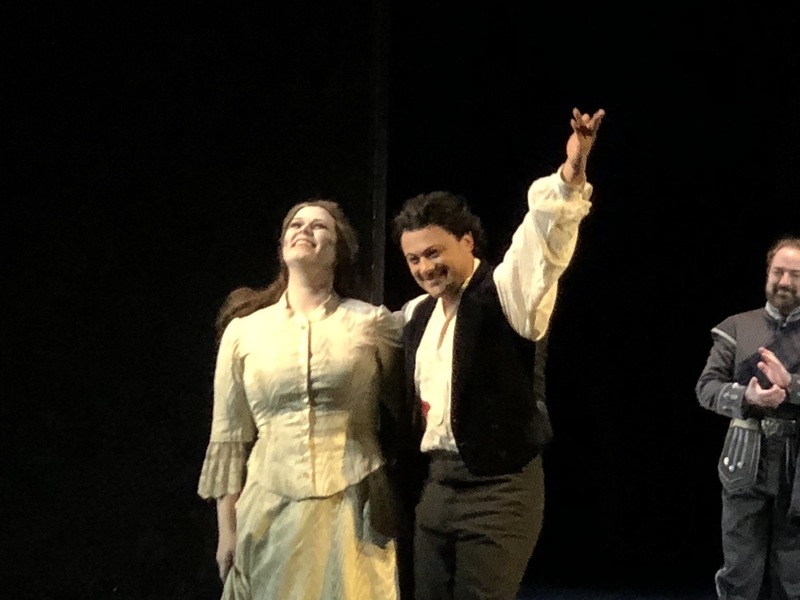 In a perfect example of the origins of the term bel canto, when Lucia describes her great love Edgardo in “Quando rapito in estasi,” the beauty of the music enhances the meaning of the lyrics. Singing downstage, Pratt bonds with the audience during this aria, the loveliness of her singing earning rising affection. 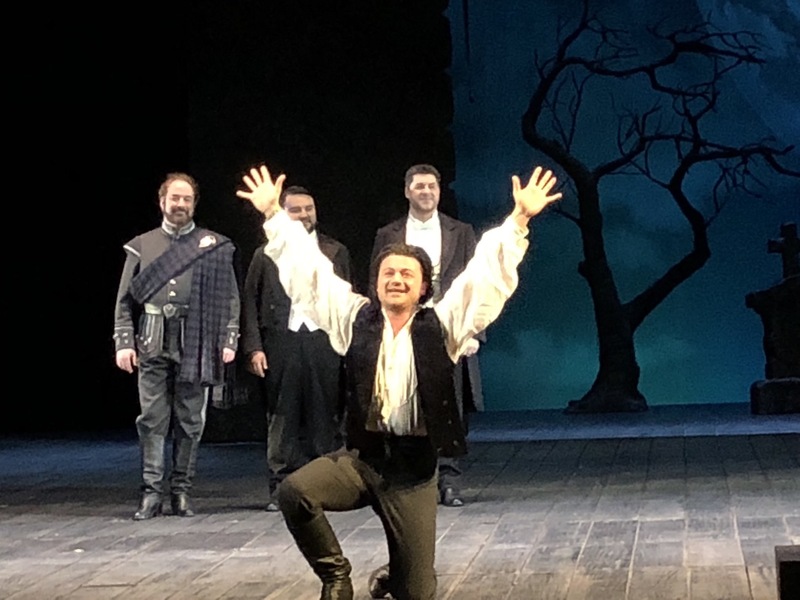 Prolific Italian tenor Vittorio Grigolo raises the stage energy another notch as Edgardo arrives to meet Lucia. Grigolo’s boyish energy adds momentum to the scene, making the impromptu outdoor nuptials all the more believable. Grigolo and Pratt wi hearts with famous duet “Verranno a te sull’aure,” the first verse of which is sung with ravishing sweetness by Pratt. After another brief sighting of the ghostly woman in white, the act two curtain rises to reveal a once grand room where Enrico sits and frets. Initially adopting a silkily seductive voice to bring his sister in line with his wishes, Salsi has Enrico take on a terrier-like tenacity as his temper slowly rises. Pratt endears herself further to the audience as she skillfully reveals Lucia’s helpless vulnerability. 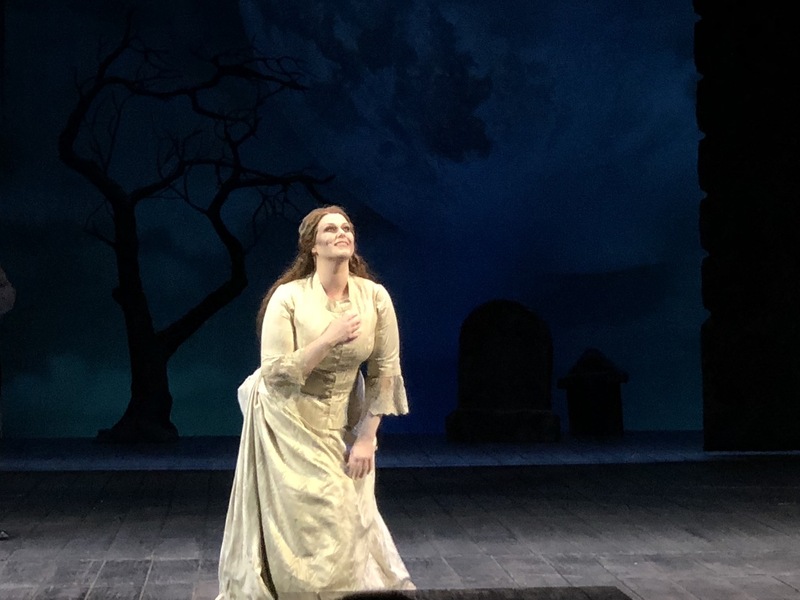 Pratt demonstrates the flexibility of her instrument, singing altissimo notes with wondrous control and then pouring forth with power so as to be easily heard over the full cast as the act comes to a climax. Transitioning to the wedding scene, Zimmerman stages a visually arresting sequence in which the curtains are torn from the windows to let in light, cloths are removed from candelabra and furniture, and two grand chandeliers are lit and raised into place. Restored to former glory, the room features wood paneling and brocade wallpaper in a pleasant pale mint green shade and ornamentally finished with gleaming gilt trim. For the signing of the marriage contract, costume designer Mara Blumenfeld has Lucia in vivid scarlet wedding dress to match Enrico’s vest, while groom Arturo sports a moss green vest for his family colours. The handsome set of wedding guests are uniformly dressed in shades of pale grey. As act two begins, Pratt enjoys strong chemistry with Salsi, then ramping up Lucia’s helplessness opposite the sonorous bass of Kowaljow. An excellent actress, Pratt portrays Lucia as a believable character, keeping artificial operatics well at bay. Pratt shows Lucia’s resolve slowly crumbling, the fake letter about Edgardo pushing her over the edge to a state of collapse. Far from a blushing bride, when Lucia enters for the signing of the contract her persona already seems broken in Pratt’s vacant eyes. Edgardo makes a dramatic entrance, and the celebrated sextet “Chi mi frena in tal momento” is underway. The sight of her beloved, who she believes to have betrayed her, is too much for Lucia, and she and Edgardo take time to confront each other. As the sextet reaches its climax, finished with a stunning interpolated high note from Pratt, the moment is given room to breathe as the company stays in place while smoke from the photographer’s flash unfurls overhead. Set designer Daniel Ostling provides another large scale set for the wedding reception. From a wooden hallway suspended high overhead, a grand curved wooden staircase comes down to floor level. Raimondo interrupts the festivities and solemnly informs the guests of Arturo’s tragic death at Lucia’s hand. A gigantic moon on the rear night sky seems carefully chosen to tie in with the lunacy that is about to be seen. The mad scene is a difficult act to follow. Grigolo shows Edgardo pouring every fibre of his being into his wish to die without the love of Lucia. Zimmerman’s ghost story comes full circle when Lucia appears as a ghost to Edgardo, her presence a factor in his final deadly act. Overall, a highly auspicious evening for Pratt, with her glorious voice heard at its very best. Much as the audience appreciated all aspects of Pratt’s performance, the ease of her interpolated high notes was clearly the most impressive aspect. 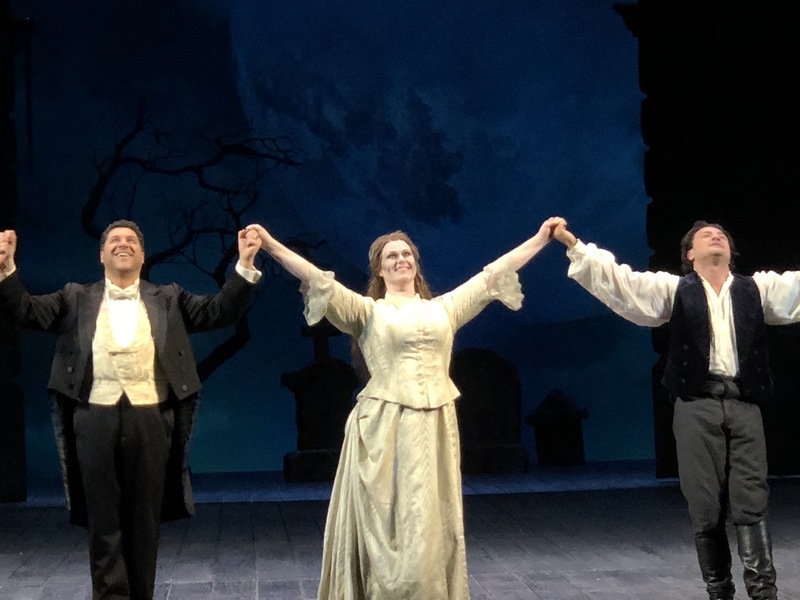 Lucia di Lammermoor was reviewed 7.30pm Wednesday11 April 2018 at Metropolitan Opera, where it plays select dates until 10 May 2018. Jessica Pratt sings the role of Lucia again on 14 April 2018. 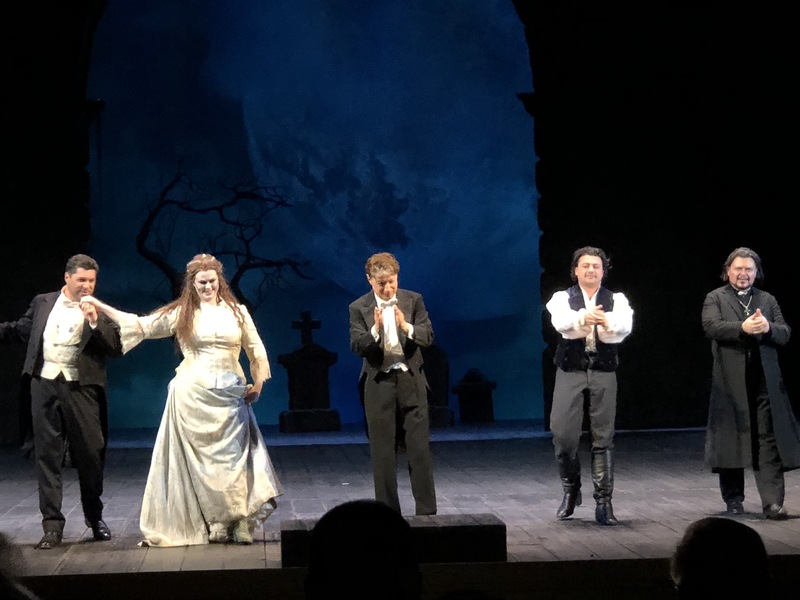 The Lucia di Lammermoor playbill can be read online.